5. How can lawyers collaborate? The best legal solutions, business of law innovations and client relationships derive and benefit from collaboration. An increasing buzz word in legal circles, it is worth thinking about why it is so important to be conscious about collaboration. Law as a vertical sector tends more to the silo-thinker than the open one. However, our research for the FT Innovative Lawyers programme clearly shows that collaboration and innovation go hand-in-hand. 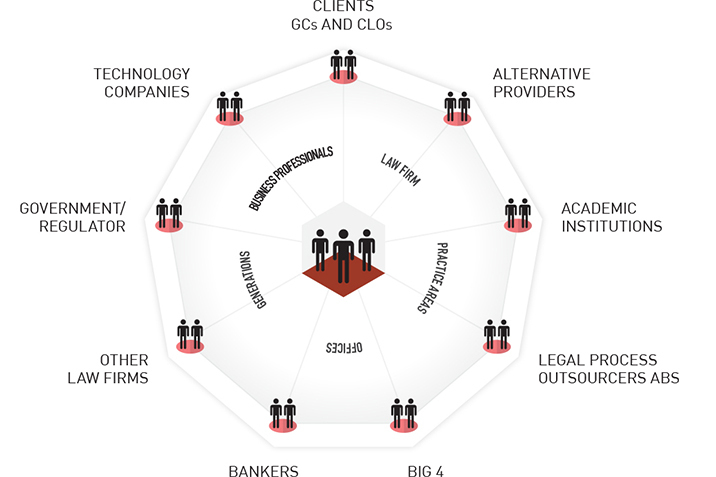 The graphic shows the universe of potential collaborators for lawyers. These are getting more rich and diverse with each passing year. Following the 2016 FT research, we are delighted to see law firms and law departments make the most of their business professional colleagues who bring their training and views to the table to great effect. Collaboration can also be painful and require sharing what was previously seen as proprietary: expertise, clients and teams. But when these barriers are broken down, we have only ever seen a win-win for clients and their lawyers.